The annual presentation of the Academy Awards is always a celebrity-studded, diamond-accessorized event. This year, the stars of The Favorite, Black Panther and A Star Is Born will be adorned with dream diamonds. And believe it or not, you can buy those same Oscar-sized carats —at a price that won’t require a month’s salary or an out-of-sight budget—by exploring the world of laser-drilled diamonds. The very best value in gem quality diamonds. Let’s face it, big-screen movies—Oscar-nominated or not—inspire romance, and romance inspires wedding proposals. Who can forget those touching proposal scenes in movies like When Harry Met Sally, Love Actually or Walk The Line? Even director Glenn Weiss got into the act last year and famously proposed onstage when he accepted an Emmy for directing The 90th Academy Awards ceremony. He got down on one knee—during a live broadcast—and slipped a diamond onto his girlfriend’s finger. How about this? Kim Kardashian is wearing an HPHT natural diamond. Processed natural diamonds are being purchased by everyone, including the rich and famous too. Whether or not your proposal is going to be seen on TV or in theaters around the globe, you really can match the size and glamour of diamonds you’ll see worn at the Oscars by celebrities like Amy Adams, Emma Stone and Rachel Weisz. That’s because the price of laser-drilled diamonds can be as much as 50 to 60 percent lower than other gem-quality diamonds of equal size and appearance—and they all look the same, even your family and friends will not notice any difference. Enlarged photo: 2.22ct laser drill oval. This diamond has been exposed to a laser application. Can you find where the drill took place? Laser drilling is the process of improving the clarity of a diamond that may have been mined with an inclusion (dark spot). A microscopic laser is used to remove the inclusion, resulting in a higher clarity grade for the diamond. Dark inclusions impede sparkle. Once the inclusion is removed, the diamond will demonstrate much improve sparkle by as much as 30%. Clean and precise, laser drilling doesn’t interfere with the integrity of the diamond. Laser-drill diamonds will always maintain their durability. The laser application is microscopic. Not visible by the unaided eye. Not even your hairdresser will know. The integrity of the diamond remains unaffected! The Gemological Institute of America (GIA) says laser-drilled diamonds—which require no special care and are worn like all other natural diamonds—will maintain their stability and appearance for a lifetime. So maybe you won’t be up for a Lifetime Achievement Award at the Oscars this year. But a laser drill diamond that is purchased via Hader Diamonds will spend its lifetime enhancing the lives of leading men and leading ladies all over the world—on and off the big screen. 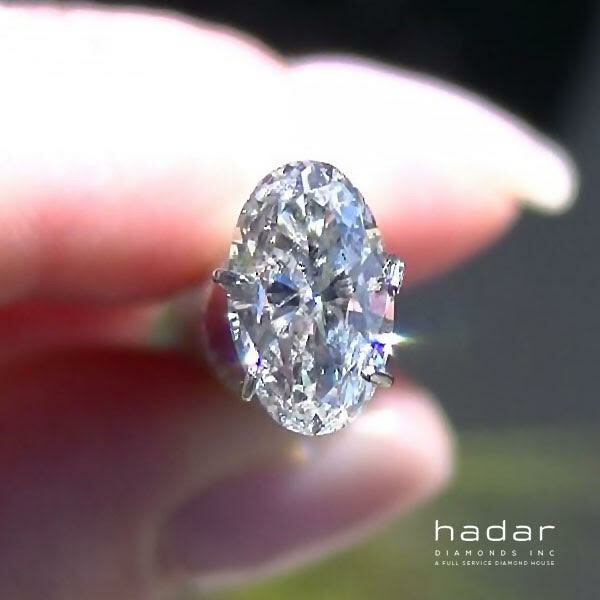 Interested in hearing how Hadar Diamonds can meet your diamond and jewelry needs? Email Gerry at Gerry@hadardiamonds.com, call 858-737-4862, or text to 619-572-8100. All potential clients have an opportunity to view diamonds at home: risk-free, no charge, and no obligation to buy. Free FedEx overnight shipping (with insurance). Go to HadarDiamonds.com for more information.